Columbia City Ballet presents Off the Wall Onto the Stage - A tribute to the world renowned award-winning artist, Jonathan Green, at Patriot Hall in Sumter, SC, Saturday, March 2 at 7:30 pm. Don't miss one of Columbia City Ballet's premiere performances, Off the Wall, at Patriot Hall in Sumter, SC, Saturday, March 2 at 7:30 pm. Critics have acclaimed this production to be the greatest addition to Columbia City Ballet’s repertoire. 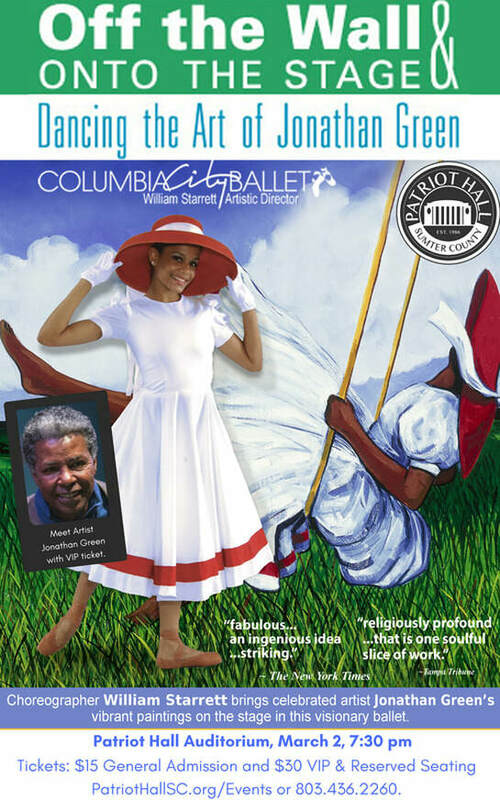 The ballet, conceived and choreographed by Starrett, was created in 2005 as a tribute to the world renowned award-winning artist Jonathan Green, known for his vibrantly colorful art depicting Gullah life in South Carolina’s Low country coast. Meet the artist, Jonathan Green, during the VIP reception before the performance. Purchase Tickets at Patriot Hall - $15, general admission and $30 for VIP (VIP tickets = reception with Jonathan Green and special seating for the performance).